I get into Willow late that afternon to find everyone hopping as KK gets ready for the jam party that night. I get moving and set my gear so I can record. I'm trying to introduce the other people in the story now more, this time with just a quick hello and welcome from KK. Its a good jam, though there's just me and a bass player, we jam. He says to call him if I ever want back-up for a gig. This is actually my dream and plan, to develop a set of local players I can depend on for back-up. Or more than that, to form a temporary band when I'm in an area. I can send them CDRs so they can keep up on the repitiore. I can maybe, finally, have a band, even if the members change as I go from place to place. But I want people I can depend on to show up somewhat regularly, even if just when I play their town, and to be ready to go, in synch with the music I'm playing. It would be even better to have people I work with so regularly that they can have an input into the show, starting me on new material. Its a nice dream. Between me and KK I have a full schedule for the next few days. 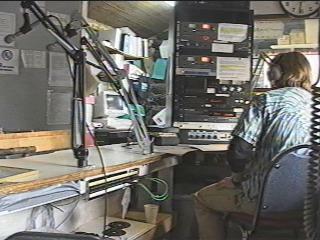 I head up to Talkeetna and do an hour for the local radio station's fundraiser, live on-the-air in Alaska! That night I play at the Talkeetna Hotel, which is empty and dead this time of year, but I don't mind. There are a few if the locals and people who work there hanging out, and I play for them. Good enough. In the morning it is snowing and I head over to the elementary school to do an assembly there. It goes off well. I'm good at playing for the kids. They are really a hard audence, wavering on a fine balance between boredom and getting out of hand, but its just great when you can do it, and they are just fascinated. Its a real satisfying thing. I also feel that this is an important part of my role as a folksinger. I am here to try and inspire the kids, show them what all the practice is for, and just get them interested in music, make it real. Its also about putting back into the community that supports me, of playing for the world, playing for the People. Playing the State Fair and the rest really pays for me doing free shows in the local schools and senior centers and rest-homes, but to me it is one job. Its seems like a long 3 months and a lot of miles since I first arrived here in late July. Summer is definitely just a memory, as the snow just keeps falling. I head over to KKs to grab a bite of leftovers, then I head back to Talkeetna for a jam that night at the H&H Lakeview lodge. One problem, nobody shows up but me. I had warned KK way back to expect this, and not be dissappointed. Fact is, lots of people say they'll come out, but in the end, few do. Still, you keep trying because sometime it does happen. I say its like surfing, you go out there to ride the waves, some ok, some great, and sometimes its a blow-out; but you can't do anything if you aren't out there giving it a shot. After an hour we are ready to head back to Willow and get some sleep. The snow is really pouring down, winter arrives like a tidal wave here. One day it is clear and then the snow arrives to stay. I get busy on making more videojournals, trying to get into a routine, and three days pass as the snow falls. Then its time to pack up and get ready to head to Tok for The Last Show. I acually had shot more footage, but somehow that tape got lost or recorded over later. 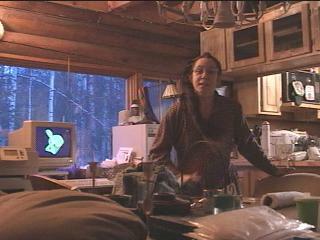 I still have never figured out what happened to it, though I remember shooting the scenes, outside the radio station and the schools I played at, and later of Matanuska glacier. I guess that is part of the routine as well, learning how to be more carefull with my tapes! Though it is also just the nature of trying to juggle so many things, on not enough sleep, and on the road. These things happen, but I was able to manage without it, though I wish I had it, and I learn to be more careful. Who knows, I may still find the tape buried somewhere in my gear.